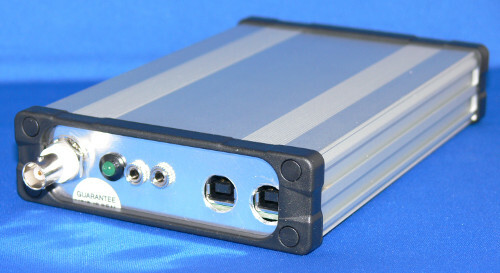 We have been manufacturing the SDR-4+ receiver for 6 years. Over that time it has had undergone a process of gradual improvement with several custom versions made for some customers. The SDR-4+ Special Edition brings all the changes together in one high performance SDR receiver combining a high IP3 push pull RF amplifier and switching mixer with improved RF filtering and a new low distortion and noise IQ amplifier. 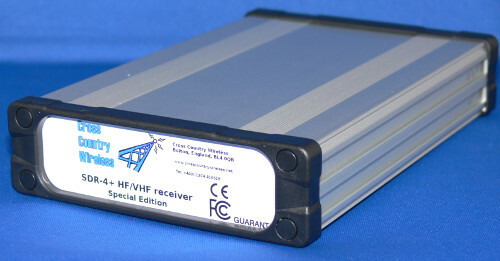 The SDR-4+ Special Edition is an HF general coverage SDR receiver covering from 0.85 to 70.5 MHz. It has a Si570 low noise synthesised VFO, relay switched band pass filtering, high linearity push pull RF amplifier and a built-in USB soundcard. Ability to select sampling rates down to 8 kHz so that a single transmission can fill the SDR waterfall display. Perfect for on-air monitoring of broadcast stations. The SDR-4+ Special Edition receiver no longer uses "dual use" (military/commercial) devices so it can now be sold without restriction. The SDR-4+ receiver set-up FAQ sheet can be downloaded as a PDF file here . The SDR-4+ receiver Quick Start Guide v1.6 can be downloaded as a PDF file here . The SDR-4+ USB driver installer can be downloaded as a zip file here . The USB installer program loads a driver certificate then the driver file so that it works on the latest versions of Windows. Existing owners of SDR-4+ receivers can have their receivers upgraded to the new Special Edition specification. Contact us via info@crosscountrywireless.net for more details. The first YouTube video is a demonstration of the strong signal handling performance of the SDR-4+ Special Edition. The receiver is listening to the background noise floor in a small gap between the strong broadcast stations in the 41m short wave broadcast band. There is a 70 dB difference between the station carriers and the background noise. . The second YouTube video is from our distributor LAM Communications giving details of the setup and use as a panadaptor. Here is a list of sample HDSDR recordings taken over the years. A selection of SDR-4, SDR-4+ and Sentinel 2 receivers undergoing a final on-air test after bench testing are used and in one case a faulty receiver back for repair. These are taken using our antennas above the workshop, it's not a low noise environment! If you have never used a SDR receiver before, download the HDSDR program from here and one of the recording files below. Open the HDSDR program and use the playback key to find and start the recording. Each recording is about 10 minutes long and you can use the tuning, filters and modes in HDSDR as if you were connected to the receiver. It's a great way to try it out and it's free. Sample HDSDR RF recording using a SDR-4+ receiver and Cobweb antenna (135 MB) Deliberate interference to the K1N DXpedition in 2015 on 15m SSB. Caution - strong language! Sample HDSDR RF recording using a SDR-4+ receiver back for repair and Cobweb antenna (118 MB) ARRL HF contest in 2015 on 15m SSB. Sample HDSDR RF recording using a Sentinel 2 receiver and single delta loop antenna for 20m (124 MB) 20m data modes activity in 2017 on 20m SSB. Sample HDSDR RF recording using a Sentinel 2 receiver and single deta loop antenna for 20m (123 MB) CQ WW SSB contest in 2017 on 20m SSB.